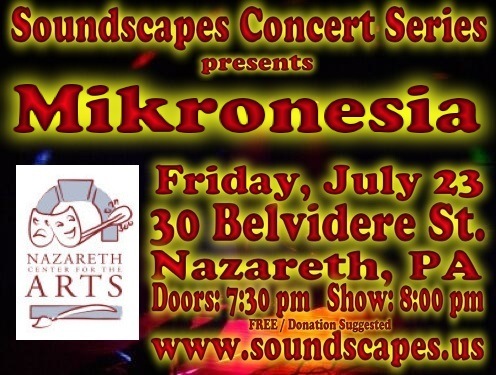 Here is the archive of the Soundscapes Concert Series. 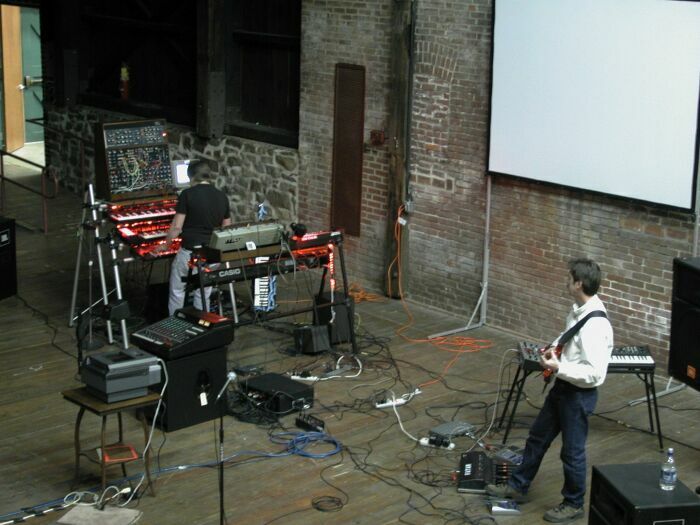 The premier of Soundscapes was on Saturday, February 16, 2002, at the City of Bethlehem's IceHouse. From spacey ambiences to Berlin School sequences, visiting progressive rock influences along the way, this inaugural event was an impressive debut concert for Orbital Decay. 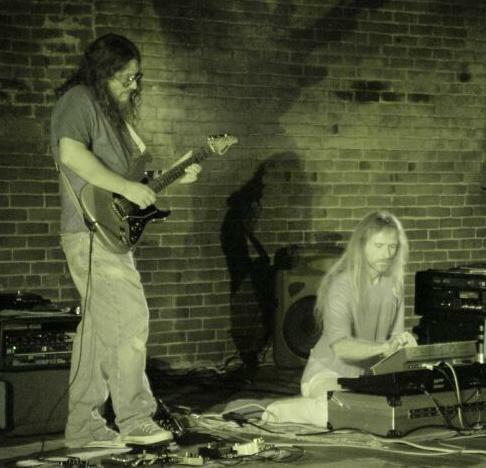 Providing computer generated images as well as virtuoso keyboard and guitar music, Orbital Decay put on a show the likes of which the Lehigh Valley has never seen or heard before. The sophomore excursion of Soundscapes was on Saturday, June 22, 2002, at the City of Bethlehem's IceHouse. The Ministry of Inside Things, considered to be among the most innovative of EM bands today, did two sets of spacemusic that transported the crowd beyond Earthly boundaries. Tom Shaw provided beautiful ambient music in the lobby when the doors opened and during intermission while Chef Jeff provided a sumptuous dinner buffet upstairs. The third concert makes Soundscapes a real series. It was held on Saturday, February 22, 2003, at the City of Bethlehem's IceHouse. Orbital Decay, one of spacemusic's best kept secrets, did two sets of spacemusic that prove that this band's CDs should be in every spacemusic fan's collection. Tom Shaw and Moe Altamura provided beautiful ambient music in the lobby before the show. And during the intermission, Chef Jeff provided a sumptuous dinner buffet upstairs. For the fourth installment of the Soundscapes Concert Series, vidnaObmana performed Spore-influenced concert material for his newest fans, similar to what he played throughout his 2003 US tour. In addition, exclusively for the Soundscapes audience, vidnaObmana performed his familiar long-form, atmospheric soundscapes for which he is so well known. No other concert venue heard the full depth of vidnaObmana's musical talents during this US tour. For the fifth installment of the Soundscapes Concert Series, a new venue was finally found after seven years, allowing the concert series to resume operations. To set things in motion, local artists having international reputations were invited to play, Technicolor Travel Agency and Twyndyllyngs. 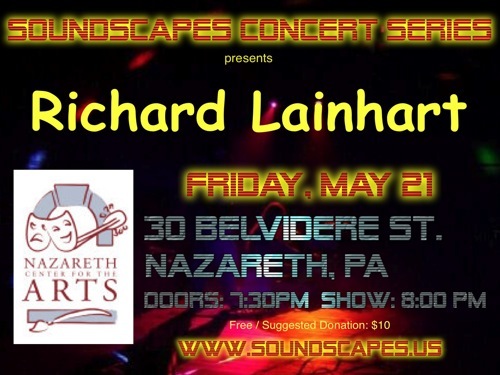 For the sixth installment of the Soundscapes Concert Series, award-winning Richard Lainhart improvised soundtracks to some of his movies. He played two sets. The first set was played on a Haken Continuum controller and a Buchla 200e analog synthesizer. For the second set, Richard played guitar, processed through a laptop. 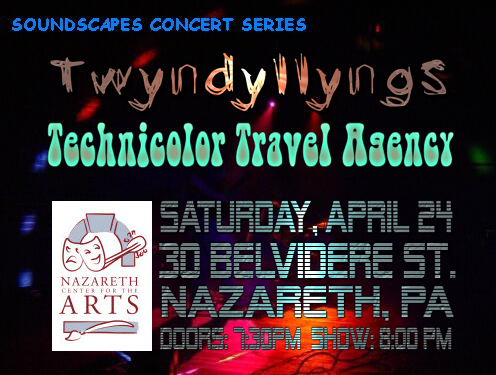 For the seventh installment of the Soundscapes Concert Series, the Nazareth Center for the Arts again played host to SCS. This episode saw Philadelphia-based Mikronesia in action. For the eighth installment of the Soundscapes Concert Series, UK-based Modulator ESP improvised two sets of music based on ambient, noise, and Berlin School styles. For the ninth installment of the Soundscapes Concert Series, the Nazareth Center for the Arts again played host to SCS. This episode featured The Tangent Project from the Philadelphia area. For the tenth installment of the Soundscapes Concert Series, Chuck van Zyl came from Upper Darby and played two sets of music based in the Berlin School tradition with ambient flavors added in for good measure. 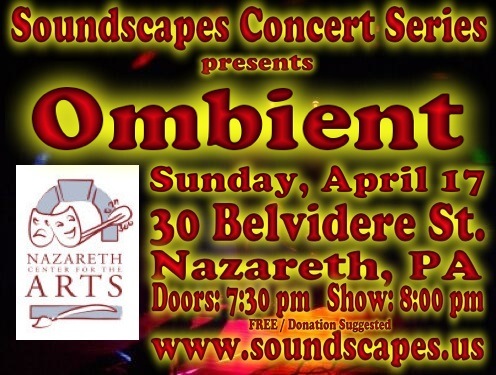 For the eleventh installment of the Soundscapes Concert Series, Ombient came from Trenton, New Jersey. For the twelfth installment of the Soundscapes Concert Series, Mark Jenkins came from the UK and played music for The iPad Album and Supernova, his latest planetarium show. All sounds came from two iPads and one borrowed synth. He could have performed without that synth, too! For the thirteenth installment of the Soundscapes Concert Series, Modulator Experimental Synthesis Project, a.k.a. Jez Creek of Nottingham, England, returned to the Soundscapes Concert Series. He remains one of the more popular acts to have appeared at the SCS. For the fourteenth installment of the Soundscapes Concert Series, there were two acts. Dean De Benedictis and Vic Hennegan came from California and Bernhard Wöstheinrich came from Germany. Both acts were making the rounds of the East Coast, playing concerts and on radio shows. For the 15th installment of the Soundscapes Concert Series, Mark Jenkins returned with another great show. 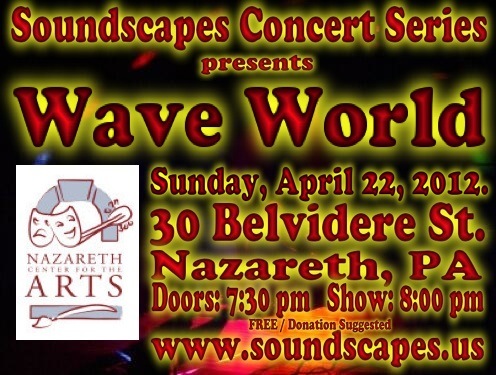 For the 16th installment of the Soundscapes Concert Series, Wave World brought their music and stunning animations to play before our intimate audience. 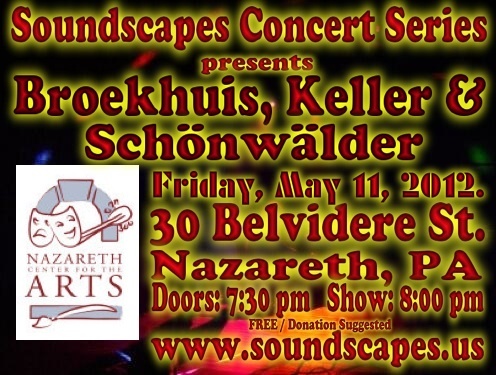 For the 17th installment of the Soundscapes Concert Series, Broekhuis, Keller and Schönwälder came all the way from Germany and Holland to play a string of east coast concerts. 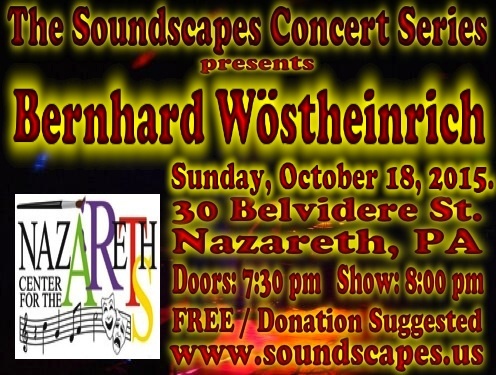 For the 18th installment of the Soundscapes Concert Series, Bernhard Wöstheinrich returned to the USA to collaborate with Tim Motzer of Philadelphia. 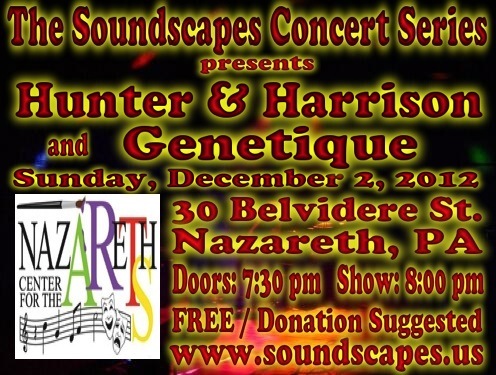 For the 19th installment of the Soundscapes Concert Series, Genetique opened the show and Hunter and Harrison rounded out the eveing. Artist archive not yet available. 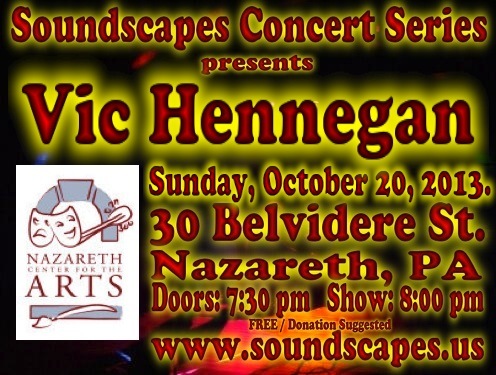 For the 20th installment of the Soundscapes Concert Series, Vic Hennegan came from California to play. 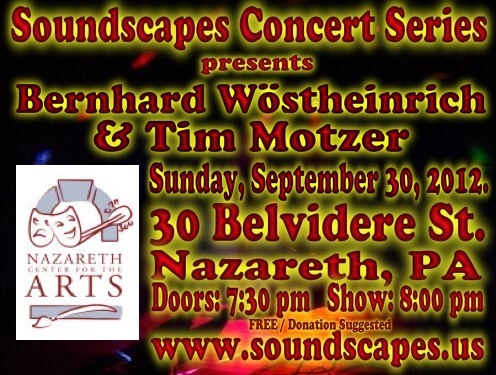 For the 21st installment of the Soundscapes Concert Series, Bernhard was scheduled to play but the surprise was that Tim Motzer came up from Philadelphia and joined in the fun. What a treat. 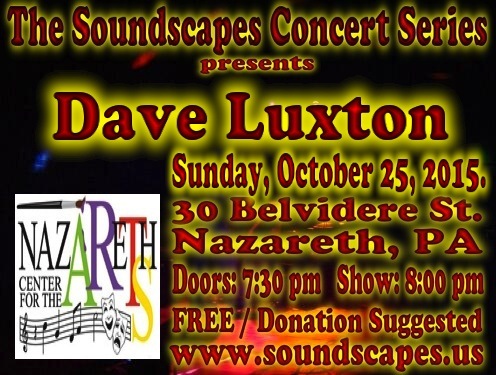 For the 22nd installment of the Soundscapes Concert Series, Dave Luxton came from the west coast to play. Thanks to Howard Moscovitz for graciously hosting this website.